Fall is a dazzling time of year in upstate New York and there are many places on the Trail to enjoy the colors. The area featured in this column should provide many opportunities to see nature’s finest on both the drive and the trail. We will describe two hikes that we researched, and mention some other possible activities and sights along the way. This area would make a nice weekend getaway in the fall, or any time of year. 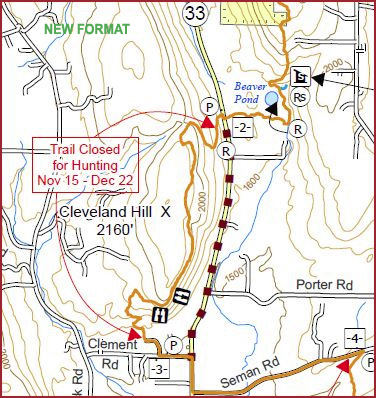 Both hikes are on map M-31A near the eastern end of the Trail in the Balsam Mountain Lake Wild Forest. As these hikes are in the Catskills Forest Preserve, the trails are marked with colored New York State Department of Environmental Conservation (DEC) disks rather than white blazes. The first hike is very family-friendly and circles Alder Lake. 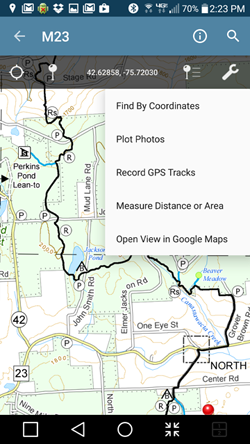 The 1.5 mile loop is level and has bridges over the several streams you cross. You will get views of the lake and the hills that ring it and, with luck, a beautiful reflection in the tranquil water. The walk is mostly in the shade in mixed deciduous woods, which should turn many different colors in the fall. There is a wide expanse of lawn at the head of the lake where you can have a picnic and make a day of it. There are spacious primitive campsites sprinkled around the lake if you want to hike in with your camping gear. The lake is home to bullhead and several species of trout for those interested in trying their hand at fishing. If you want to be sure to see fish, stop at the fish hatchery on Alder Lake Rd near Beaverkill Rd. The second hike is much more challenging but reaps appropriate rewards as you climb to the Balsam Mountain Lake fire tower. The 360-degree views from the tower are spectacular, and on a clear day it is said you can see five states (we’ve never had a clear day, but it was still spectacular). This is the highest spot in the Catskills and as far as the eye can see are miles of hills covered with mixed deciduous forests. You can climb the tower up to the cab any day, but on weekends from May through September, the tower’s cab is open and there are friendly interpreters on site to answer any questions you may have. The old caretaker cabin is being converted into a mini museum featuring information on the flora and fauna of the area, as well as some history of the tower itself. There are plans to have this building open several weekends a month in the winter to serve as a warming hut, but that has not been finalized as of this writing. This hike is about two miles one way and gains about 1200 feet in elevation, most of it in a half-mile stretch with a pitch of 30% over lots of rocks. There are a number of good resting spots along the way, including a lean to. While you are climbing, notice the nice rockwork that trail crews have done to make steps and divert runoff. Some parts of the trail can still be quite wet, so wear appropriate footgear. The drive to the hikes is lovely as you will be crisscrossing the Beaverkill river much of the time and winding through picturesque countryside through the mountains. There are many examples of fine stone fences in this area. Short detours take you to two covered bridges: one by the Beaverkill State Campground and the other just north of the Livingston Manor exit of Rt. 17. There are many other hikes in the immediate area. For those wanting a longer hike, take the FLT from the Alder Lake trailhead in first hike east to the Balsam Lake Mountain fire tower. This is about a 13 mile round trip, with many vistas in addition to those from the fire tower. You can also get to the fire tower from the Dry Brook Ridge Trail, which comes in from the north, off Mill Brook Rd. 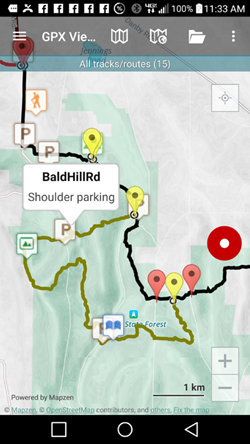 This is a six-mile round trip, but it climbs less elevation and is less steep than the hike described in this column (but it is not part of the FLT). 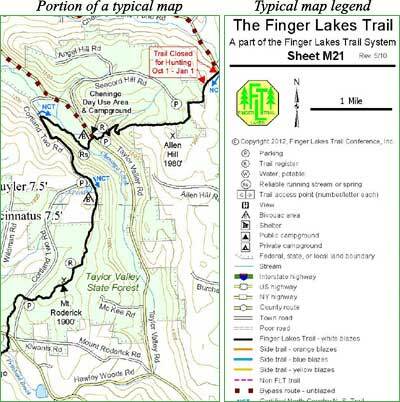 Other non-FLT trails in the Balsam Lake Mountain Wild Forest are the Kelly Hollow Trail and the Neversink-Hardensburgh Trail; a brochure on the area is available from the DEC. So go exploring and enjoy the fall colors!